When it comes to killer nails, Lady Gaga’s latest manicure could actually do some damage. The pop star stepped out with a huge sharpened talon on her finger on Saturday morning. The five-inch feature nail looked seriously scary, as she flashed it at photographers. Surrounded in fans, the singer cut a striking figure in the dark cold night wearing yet another of one of infamously out there outfits through Manhattan’s famed fashion district Madison Ave. The 26-year-old stood out wearing a snow white ensemble which included a highly structured white mini dress with a long train and exaggerated shoulders, a matching fur coat and sky-high black stilettos. Just in case the look did not scream ‘I am a rockstar’ enough, the Mother Monster donned large round – and very dark sunglasses – for the late night almost morning stroll. The Born This Way singer did prove she is willing to suffer for her fashion as despite having her fur coat to keep her warm, her dress’ shoulder detail prevented her from wearing it, forcing the New-York born star to carry the coat. Gaga’s penchant for fur has landed her in deep trouble previously with animal rights group PETA, but the 26-year-old has defended her coats saying they are pieces of art. ‘I have truly always stayed away from skinned fur, especially I have never been able to afford a nice one, but this does not mean my morals are rigid and that I won’t bend at the sight of an absolute art piece of a coat,’ she said. Real or fake fur aside Gaga – who’s real name is Stefani Germanotta – added some extra edge to her look thanks to some serious fake nails. However, all the trouble the star went putting together her outfit was almost her downfall. The singer narrowly missed taken a tumble from her giant platform stilettos when her even larger bodyguard accidentally stepped on the train of her dress. Luckily Gaga managed to keep her balance as any fall could have spelt disaster for her highly anticipated performance with the Rolling Stones on Saturday night. The singer will step out with the iconic English rockers in New Jersey for their final fiftieth anniversary gig. 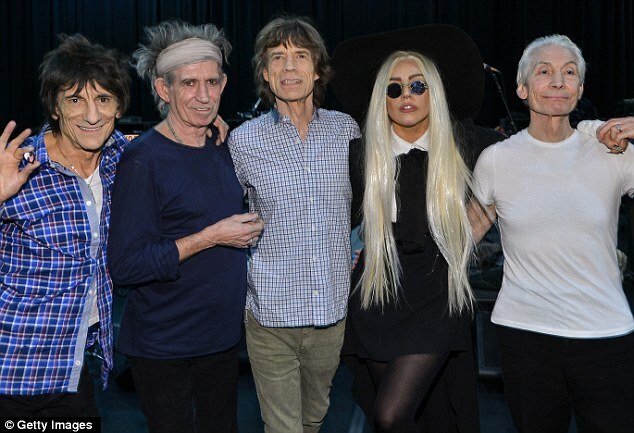 Gaga practiced with The Stones on Friday and while what she will sing is supposed to be a secret, the Poker Face songstress let it slip that the powerful duet Gimme Shelter is the most likely. ‘Gimme Shelter. It just two nights away!! 🙂 Can’t wait to sing with the Rolling Stones on Saturday Night. In 2007 I was stripping to them,’ Gaga tweeted on Thursday, making reference to the period she was a go-go dancer. Also joining the anniversary gig is rockers Black Keys and fresh from the 12.12.12 Sandy fundraiser concert Bruce Springsteen. New world order If you are interested in success and you want to be rich,wealthy,famous,influential,stardom,and you want your dreams to come through,then you have the chance to do that,join the illuminati today to get $250000 every 3 days and $1000000 membership blessing for doing what you love to do best.contact [email protected] today to change your life for the better…..